[157 Pages Report] chemical tankers market was valued at USD 25.59 Billion in 2016 and is projected to reach USD 33.11 Billion by 2022, at a CAGR of 4.5% between 2017 and 2022. Note: Chemical tankers market includes revenues earned through shipping of chemicals and related products. The base year that has been considered for this study on the chemical tankers market is 2016 while the forecast period considered has been from 2017 to 2022. Top-down approach has been used to estimate and validate the size of the chemical tankers market. It has also been used to estimate the sizes of various other dependent submarkets of the overall chemical tankers market. The research study that has been used in this study involved extensive use of secondary sources, directories, and databases such as Hoovers, Bloomberg, Chemical Weekly, Factiva, and other government and private websites to identify and collect information useful for this technical, market-oriented, and commercial study of the chemical tankers market. The supply chain of the chemical tankers market starts with the companies manufacturing chemical tankers. It is followed by owners of chemical tankers, who import and export chemicals from the chemical manufacturing companies and other users. The major players in the chemical tankers market are Bahri (Saudi Arabia), Stolt-Nielsen (UK), Odfjell (Norway), Navig8 (UK), MOL Chemical Tankers (Singapore), Nordic Tankers (Denmark), Wilmar International (Singapore), MISC Berhad (Malaysia), Team Tankers (Bermuda), and Iino Kaiun Kaisha (Japan). This research report categorizes the chemical tankers market based on product type, fleet type, fleet material, fleet size, and region. 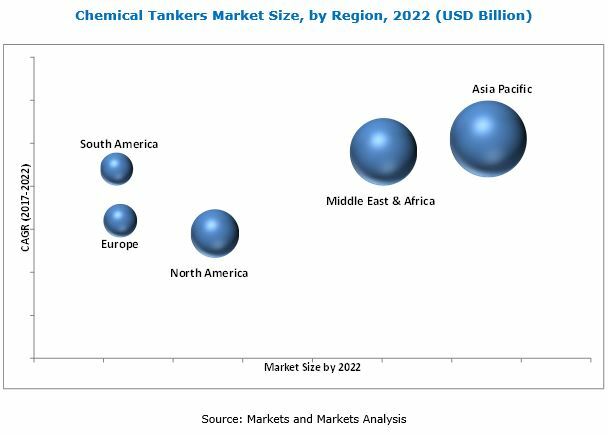 The chemical tankers market is projected to grow from USD 26.63 Billion in 2017 to USD 33.11 Billion by 2022, at a CAGR of 4.5% between 2017 and 2022. Note: Chemical tankers market includes revenues earned through shipping of chemicals and related products. The flourishing chemical industry and increasing capacities of chemical manufacturers are driving the demand for chemical tankers across the globe. 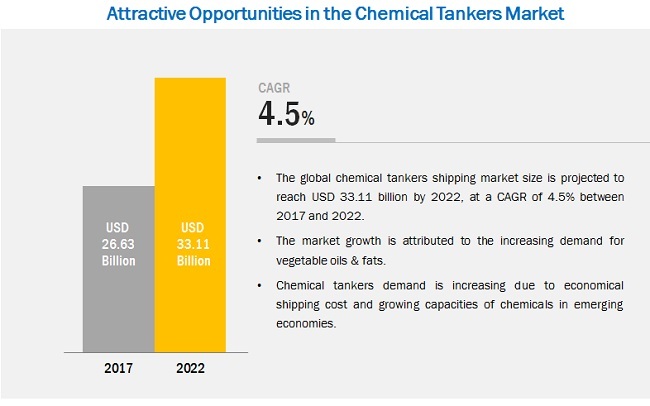 Moreover, the increasing demand for vegetable oils & fats is also expected to fuel the growth of the chemical tankers market during the forecast period. Based on product type, the chemical tankers market has been classified into organic chemicals, inorganic chemicals, and vegetable oils & fats. The vegetable oils & fats segment of the chemical tankers market is projected to grow at the highest CAGR, in terms of both, value and volume during the forecast period. The growth of this segment of the market can be attributed to the increasing awareness among masses about the health benefits resulting from the consumption of vegetable oils & fats. Based on fleet type, the chemical tankers market has been classified into IMO 1, IMO 2, and IMO 3. The IMO 2 fleet type segment of the chemical tankers market is projected to grow at the highest CAGR, in terms of value and volume during the forecast period. 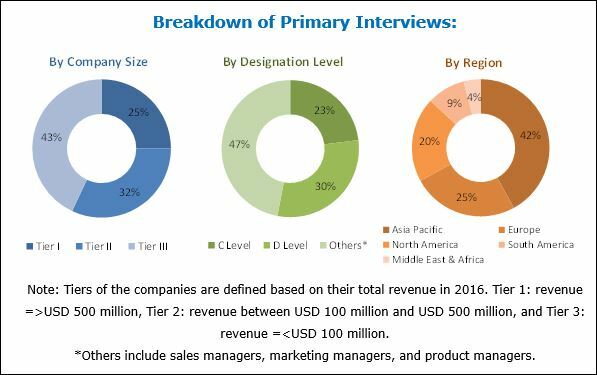 The growth of the IMO 2 fleet type segment of the chemical tankers market can be attributed to the use of IMO 2 chemical tankers for shipping vegetable oils & fats along with different types of chemicals such as alcohols, alkanes, and alkenyl amide. Based on fleet size, the chemical tankers market has been categorized into inland chemical tankers (1,000-4,999 DWT), coastal chemical tankers (5,000-9,999 DWT), and deep-sea chemical tankers (10,000-50,000 DWT). Deep sea chemical tankers are widely used chemical tankers for transporting chemicals as they have a large number of segregations. Based on fleet material, the chemical tankers market has been segmented into stainless steel and coated. Chemical tankers have epoxy, phenolic, or zinc coatings. Epoxy coatings possess good resistance to alkalis, seawater, wines, vegetable oils, crude oils, gas oils, lube oils, jet fuels, gasoline, and weak acids. Most zinc coatings are porous and tend to trap or hold previous cargos, making it difficult to clean them to a good extent. The Asia Pacific region is estimated to be the largest market for chemical tankers during the forecast period. The Asia Pacific chemical tankers market is also projected to grow at the highest CAGR, in terms of value and volume during the forecast period. China is projected to lead the Asia Pacific chemical tankers market during the forecast period. The China chemical tankers market is also projected to grow at the highest CAGR, in terms of value and volume during the forecast period. Slow growth in the production of crude oil and formulation and implementation of regulations related to oil bunkering act as restraints to the growth of the chemical tankers market. Low international prices of crude oil and reduced capital investments for its exploration over the past few years have led to the slow production of crude oil. Moreover, low investments for exploring and producing crude oil between 2013 and 2015 in the US have impacted the production of shale oil in the country. The oil production has decreased in China as well, owing to the low oil price environment in the country. The major players operating in the chemical tankers market are Bahri (Saudi Arabia), Stolt-Nielsen (UK), Odfjell (Norway), Navig8 (UK), MOL Chemical Tankers (Singapore), Nordic Tankers (Denmark), Wilmar International (Singapore), MISC Berhad (Malaysia), Team Tankers (Bermuda), and Iino Kaiun Kaisha (Japan). These leading players have adopted the strategy of agreements to increase their shares in the chemical tankers market and cater to the increasing demand for tankers used for shipping chemicals and chemical products. For instance, Odfjell (Norway) signed an agreement with Sinochem Shipping (Singapore) in November 2017. According to this agreement, Odfjell (Norway) is expected to take four new orders from Sinochem Shipping (Singapore) to manufacture 840,900 DWT chemical tankers. This agreement aims at enabling Odfjell (Norway) to serve the growing demand for chemical tankers, which are used to ship chemicals and chemical products. The leading players operating in the market have also adopted the strategies of expansions, joint ventures, agreements, and acquisitions to increase their shares in the chemical tankers market between 2014 and 2017. 12.5 Mol Chemical Tankers Pte. Ltd.
12.9 Team Tankers International Ltd.
12.10 Iino Kaiun Kaisha, Ltd.
12.11.5 Aurora Tankers Management Pte. Ltd.